The price depends on the season of the year only. No discounts for long-term stay. 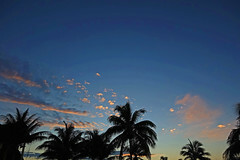 When is the best time to come to Holguin? I have stayed at Yazmin in April 2013 and was astonished how clean, quiet and modern this apartment was. No cheap carpentry, attention to detail everywhere and even the towels were of much higher quality then you get in other casas in Cuba. I was missing a phone, but even then: this is an excellent value for money. Count on me, Yazmin, I'll be back. "Dredging is the operation of removing material from one part of the water environment and relocating it to another. In all but a few situations the excavation is undertaken by a specialist floating plant, known as a dredger. Dredging is carried out in many different locations and for many different purposes, but the main objectives are usually to recover material that has some value or use, or to create a greater depth of water"
In this case they seemed to be dredging a bay for small boats or just swimming and using the sand to create a beach opposite. MAUSOLEO A LUCÍA ÍÑIGUEZ, MADRE DEL GENERAL CALIXTO GARCÍA ÍÑIGUEZ. Sirviendo de fondo a la Plaza de la Revolución mayor general Calixto García Íñiguez, se encuentra el Bosque de los Héroes, singular parque que perpetuara por medio de monumentos conmemorativos a los héroes caídos a lo largo de la lucha del pueblo cubano por la independencia y la libertad. En ese lugar se construyó un mausoleo a Lucía Íñiguez. Sus restos fueron trasladados, el 7 de mayo de 1983 desde el cementerio de la ciudad para reposar eternamente al lado de los de su hijo. El mausoleo consta de una bandera cubana erguida, construida en hormigón, en líneas verticales rectas, con una sección en forma de una letra S abierta. 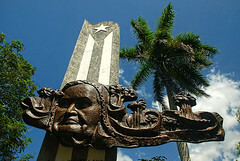 Adosado a la bandera por su parte frontal y colocado en forma horizontal se encuentra un relieve forjado en cobre, que representa la efigie de Lucía con un velo de pesado cemento que se extiende hacia la derecha, convirtiéndose en un paisaje cubano con palmas y montañas. El rostro de Lucía ocupa la zona del municipio Holguín, cabecera de provincia y el resto del mapa de la actual de la actual provincia se forma con el velo y el paisaje del relieve. La obra escultórica se debe a José Montero Hernández y Fausto Cristo Campos, los que contaron con la colaboración de la arquitecta Consuelo Ledón y el ingeniero Edialberto Padilla. FOTO DE: AIN/Juan Pablo CARRERAS. The greater yellowlegs (Tringa melanoleuca) is a large North American shorebird. The genus name Tringa is the New Latin name given to the green sandpiper by Aldrovandus in 1599 based on Ancient Greek trungas, a thrush-sized, white-rumped, tail-bobbing wading bird mentioned by Aristotle. The specific melanoleuca is from Ancient Greek melas, "black", and leukos, "white". Large sandpipers were once popular game for bird hunters. In the late nineteenth and early twentieth centuries, many a fashionable restaurant featured gourmet meals with willet or curlew. Now shorebirds are protected, but only after many species were brought to the edge of extinction. The common names of large pipers often derive from the hunting era. Yellowlegs, for instance, are also called tattlers because these high-strung birds would be the first to raise a noisy alarm when shooters were spotted.